Today's guest post is by my friend and critique partner, Susan, who also happens to be a brilliant and incisive editor and the author of the wonder HARRY POTTER FOR WRITERS. She's also featured in the anthology SWEETER THAN TEA, which is out today on Kindle and will be available shortly in book form. You can find her on her blog or on Twitter at @HP4Writers. Having recently completed an edit on a very well-written manuscript, a point was driven home to me on the importance of crafting every single word we write. Precise, active words make the difference between a pretty egg and a speckled robin's egg, between "he played the guitar" and "he strummed the guitar." adjectives - Generic descriptions like gorgeous or kind don't really go far in describing that flower or girl. But if you choose words that show why that flower is pretty or how the girl is kind, the reader will grasp your meaning better. I will like a girl with "hands rough from constructing a Habitat house" more than a will a "generous teen with a heart of gold." verbs - The first level of verb editing is to make sure that you've used the strongest verb possible for your action without going over the top. We don't need people "exclaiming" in dialogue tags, but too much walking and turning and looking gets boring as well. One of the reasons adverbs get a bad rap is because they are often used to support a weak verb. However, when a stronger verb is chosen, the adverb is no longer needed. In a higher level of edits, the skilled writer will also consider character development in choosing their verbs. Anyone can sigh or smile or turn or look, and in some manuscripts (mine! ), characters do this hundreds of times. However, only will a librarian stack an armload of books to cart off to the shelves, or an entomologist pin a butterfly and spread its wings for display. POV words - If writing in deep POV, you usually will not need to say "he thought," or any of the sensory verbs such as "he heard," "he saw," "he smelled," etc. You can simply show it happening and eliminate these weaker words. Instead of "He heard the children's laughter from outside," you could simply say "The children's laughter floated in from outside." over-used words - We all have them. These words can be found in any of the categories mentioned above plus others. Verbs like sighed, smiled, glanced, turned, stepped, laughed. These are our crutches. They are easy to use, comfortable, and often necessary. But sometimes they can point to less than exciting action taking place. Look behind these words to the setting and action of your story. If you're using these comfort-verbs too much, does it mean you need to kick your action up a pace? Can you take your characters to a more interesting setting where better action can be found? Then there the throw-away words that slip into our manuscripts often without our notice but don't carry their weight in presenting a strong text. Qualifying words like just, quite, very, rather. Or compound structures like "started to" or "could have." subtext - Subtext comes in many forms and can be somewhat hard to define. But overall, subtext is anything hinted at below the text of a manuscript and not laid-out obvious for the reader to discover. Subtext can reveal hidden emotions, motivations, relationships, clues. Subtext can also carry theme in a way that would come across as preachy if presented above text. And this is where precise wording can be so beneficial. Say you're playing with a character seeking redemption for past wrongs, and this character is a heart surgeon. You could choose words that play on cutting open hearts, surgical changes, forgiveness and mercy throughout your manuscript without belaboring the point. For subtext, these words would not be part of a speech on redemption, but rather subtly inserted in common action and dialogue...that still carries the message to the heart of the reader. As writers, we start with words, we study and grow our craft through words, and we end with words. Each word must earn its place in our story. I liken it to pregnancy. A pregnant woman is told, repeatedly, that every bite counts in contributing to the health of her unborn child. In writing, every word counts in contributing to the life of your manuscript. The more brilliant writers will not only nail their character growth and story arcs, but will study every word they employ to make sure their stories sparkle and keep their reader's eyes transfixed to their page. Great post and excellent checklist of things to watch for as we strengthen our manuscripts. I think JK (and I know you will agree) is a master of subtext. I encourage everyone reading and commenting here to check out your Harry Potter blog, because they will learn so much through your study of JK's Harry Potter series! I also think that authors need to realize that editors shouldn't be expected to make your work perfect. The author should make their work as close to 'clean' or well edited as possible BEFORE expecting the editor to review. If the work is in the best shape possible, it can only get better when the editor doesn't have to sift through tons of minor issues to find the big problems or areas to be fixed. You've hit on a really important point, LM. The better our manuscripts are before an editor sees it, the better quality feedback the editor can give and the better final shape it will be in for the reader. Such inspiration. I'm not to the point of word editing like that but your post makes me want to be there! Great thoughts. Editing and second (third and fourth...) drafts are definitely a different writing experience than the first. My struggle is not spending too much time focusing on what you said during the first draft; I tend to want my first drafts perfect (ha!) and spend a lot of time editing as I go, when it might serve me better to get the story down and then go back. I suppose there's no one right way. Finding stronger verbs is a good reminder. I also read in a craft book to do as much description with nouns and verbs, pushing yourself to move beyond too many adverbs and adjectives. Adverbs I can do away with, but the adjectives creep in for me. I think the point is to use them sparingly and then the writing is strongest. I think it's all about being as precise as possible with any of the forms of words we choose. Make each word carry its weight. Adverbs are not inherently evil, nor adjectives, or even the qualifying words or those we overuse. But they all need to be evaluated as to whether they are needed, and if so, are they the strongest, most precise we can make them without getting purple. Also, every writer has a different process of writing that works for them. For many of us, I think it is helpful to not let our editing minds interfere with our creative, and vice versa. When we create, we want to be as free as possible. When we edit, we want to make sure it's working. But, to each her own. 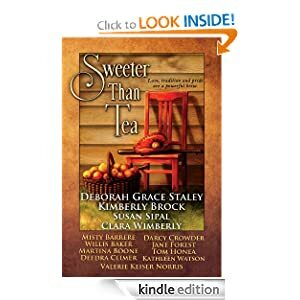 I just noticed that Martina did not mention that she is also one of the authors in Sweeter Than Tea. I hate to sound promotional, but you've GOT to read Martina's fabulous story, Bringing Lula Home. It's very touching and has a wonderful atmosphere and setting. Thanks so much, Martina, for hosting me! I love this post. It's full of helpful reminders -- things we need to keep in mind but are easy to let slip away. Thanks. I'll be linking to this on my next blog post. Thanks Rosi. And you're right, it's the little things like these details that can be so easy to forget. You're right, Stina. And I have a long, long list of them! Thanks for sharing all the excellent tips on editing Susan. They are all so true. Awesome post. I've been going through my ms using wordle and the lovely Find tool to eliminate some of those crutch words! Sometimes, we can forget the extra beauty in describing things. But this post is a great reminder of many tips. Thank you. Thanks Natalie, Jemi, and Angela. So glad it was helpful! Thanks for a wonderful article! I am at this point of hacking away at the dross in my MS. This is such brilliant advice I feel I can safely ditch all the 'walked/turned/looked/smiled' words - or lots of them, anyway! Thanks Fiona, and it's nice to meet you! "Each word must earn its place in our story." LOVE this! So true. I'm currently working through another draft, trying to strengthen the manuscript. Thanks so much, Julie! I think the print version should be out by the end of the month, and also on other electronic formats.